The threes in the tarot represent the successful completion of a goal - it takes the sources of energy in the ace and the twos and adds a foundational factor, and usually involves a group of some sort. In this scenario, the upright three of pentacles meaning is that there is a successful achievement of all the requirements to pursue your business, deal, venture or any other kind of endeavor. Successful projects usually require different kinds of expertise, and at this moment, the Three of Pentacles means that all the skills required are coming together. In short, you are enjoying enjoying working together as part of a team, and also in the initial success of this bigger project. Successful projects usually require different kinds of expertise, and at this moment, the Three of Pentacles means that all the skills required are coming together. The three pentacles reveals a successful beginning towards achieving your goals, it is a sign of encouragement that you should press on with the same effort without giving up. You may struggle to accomplish your goals as an individual, but the Three of Pentacles also teaches people not ignore the talents of the others that surround you. You need the collaboration of others, with diverse viewpoints, experiences and expertise to accomplish something more than you could have ever dreamed of. 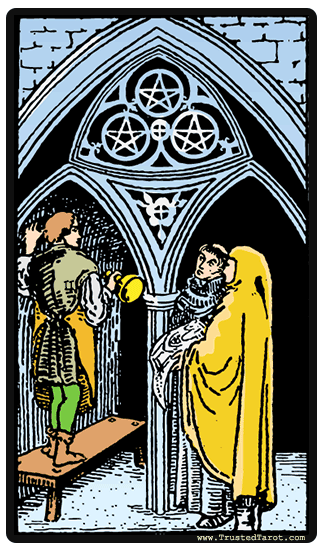 The Three of Pentacles reversal meaning indicates that there is lack of team work; it shows that people are working against each other and undermining the project along the way. There seems to be too much competition between them - each person is trying to display superiority. This result to scarcity of resources - too many people are viewing their project partners as competitors. When you are in such a team, it is good to ensure that you try as much as possible to inspire camaraderie. With this constant bickering, it is hard for the projects in the reversed Three of Pentacles to come into completion. You may find that people are not listening to others, and everyone is working for themselves. This difference in motives and ambitions yields complications. If you can be the first to reach out and give everyone a chance to be heard and considered, perhaps this project has a chance to move forward.